WROV had done news from sign-on through the late 1960s but the reporting mostly consisted of the announcers reading wire copy. The news department began, in earnest, in the late 1960s with the first "dedicated" newsman, Richard Mann. When the station was remodeled around 1970, a new production room was built and the old one became a full-time news room. Over the next fifteen years, WROV News won several awards and featured the excellent reporting of Paul Houston, Mark Fryburg, Libby Dubick, Darrell Hudnall, John Leebrick, Bruce Jacobson, Rick Mosher and Joe McKeon. Some of the above mentioned members of the news crew are going to help us write the history of WROV News. Look for it here in months to come. For now, we'll just include some pictures. 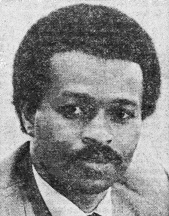 Paul Houston was there during the early 1970s then later was seen on WSLS-TV. 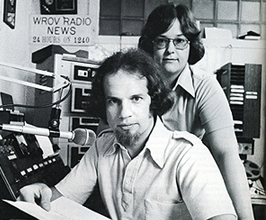 Mark Fryburg was news director for most of the 1970s and is shown in the news room with Laura Cauble. 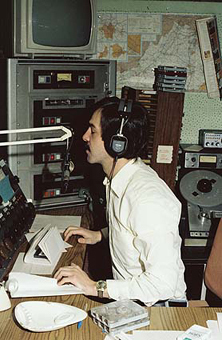 Douglas St. Clair shown here at WFIR in 1979, was at WROV in 1977 and had previously worked in Philadelphia. 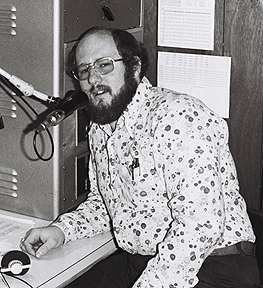 Rick Mosher in the WROV news room in 1981. Rick later worked at Channel 7. 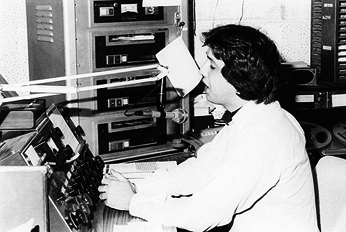 Bruce Jacobson did the news during the early 1980s before moving to the "other side of the window" in 1984. 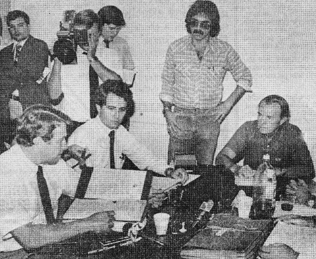 He's shown here covering a Roanoke County board meeting in 1981. There were TWO Jeff Dickersons.. This one was a news guy during the early 1980s. The other worked during the mid 1980s as an announcer and sports guy. 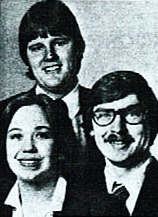 The News Crew in 1984: Jeannie Aker, Joe McKeon (front) and Jim Davis.